I had dinner with my boyfriend a week ago in one of our favorite Kebab restaurants in town. The last time we went there was sometime in September which was why I quickly noticed the place's new commercial table tops. They had round tables before which was switched to better looking and space saving rectangular ones. The restaurant looked a lot better than the old one. With more space left for the customers and waiters to roam around, there was a more relaxing ambiance which was actually quite surprising. A close friend of mine who now owns a coffee shop has once told me (by the way, I love her coffee shop a lot), "One thing a restaurant owner must bear in mind is to make the place more comfortable as possible for the guests/customers or else they will not think of coming back at all... and that the tables and chairs are two of the most important things we have to consider." Well of course! I myself will never want to go back to a place which I find chaotic and unpleasing. 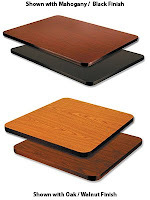 "Restaurant table tops such as the ones being sold in RestaurantFurniture.net are worth checking for. Their reversible table tops specifically the Mahogany & Black are affordable and will give the restaurant a more elegant look, " she adds. How I wish to one day own my own restaurant! Not impossible, right?